The ribbon in the bouquet is a reusable item. The green fillers are seasonal and will depend on their availability in the local market. Rose water and rose syrup are used for cooking purposes. 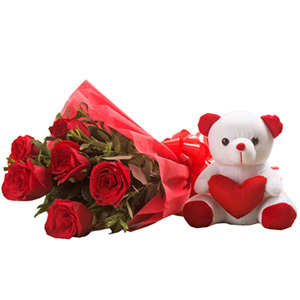 Express your heartfelt feelings by sending this beautiful red rose bouquet along with a cute and adorable teddy bear to your dear ones on their special days. 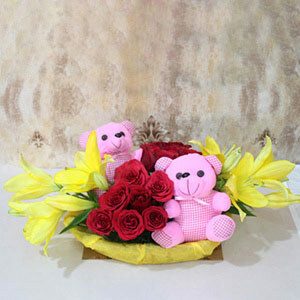 This hamper boasts of a bunch of fresh Red Roses wrapped in a transparent cellophane paper and tied with a colored ribbon. 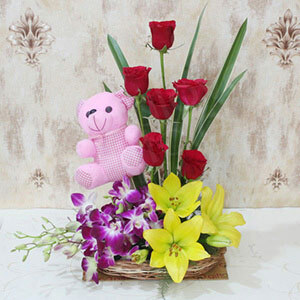 The teddy bear was really nice but the red roses were not that fresh.